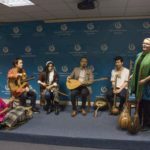 Yunus Emre Institute London hosted the SOAS Silk Road Collective music group on February 8. 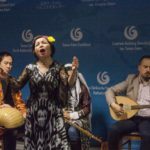 The group gave an inspired musical performance on the Silk Road and its historical cultures. 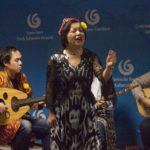 The SOAS Silk Road Collective is a London-based musical ensemble and initiative which encourages collaboration among musicians from different cultures along the ancient silk routes, and celebrates their shared cultural heritage. 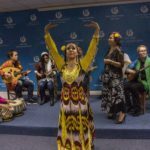 Currently, the ensemble includes musicians and students from the UK, Iran, Central Asia, India, China, Japan, Turkey and the United States, who perform a wide range of pieces from courtly and folk repertoires from Turkish, Iranian, Afghan, Uzbek, Tajik, Uyghur, and Indian musical traditions on a variety of instruments. The name of the band is inspired from the ancient trade road. 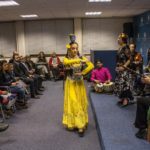 SOAS University has also a course with the same name which uses the notion of the Silk Road to explore questions of musical exchange and circulation across Asia, both historically and today. 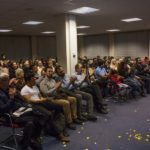 The concert by The SOAS Silk Road Collective was at Yunus Emre Institute London and enjoyed by many music lovers.